SURVIVOR (F) is a new ongoing project by Suzanne Treister (London, 1958), an hallucinogenic exploration of a post-apocalyptic reality in undetermined time and space. Whether manifestations of a sole survivor of the human race, on earth, in space, on a new planet or parallel universe, or of an artificial super-intelligence (ASI), SURVIVOR (F) presents visions of a post-futuristic sublime, charting an existential imaginary of potential human/non-human agency/non-agency and beyond, of the psychedelic consciousness of SURVIVOR (F). Generally on this planet but not necessarily. It depends on the facilities of each venue in the future. “SURVIVOR (F) is an hallucinogenic exploration of a post-apocalyptic reality in undetermined time and space.” could you explain this concept to me in a deeper way? Whether manifestations of a sole survivor of the human race, on earth, in space, on a new planet or parallel universe, or of an artificial super-intelligence (ASI), SURVIVOR (F) presents visions of a post-futuristic sublime, charting an existential imaginary of potential human/non-human agency/non-agency and beyond, of the psychedelic consciousness of SURVIVOR (F). The idea of apocalypse is also undetermined, apocalypse of what? Apocalypse of humanity, of our planet, of the galaxy, the universe, of our minds? See also this essay by Maggie Roberts and Lucy A Sames. On planes as they are taking off. A collection on another planet. The Museum of the Algorithm. I made a drawing of it yesterday. I would rather answer the question, 'Do you make art to try and save the human race or do you think the human race doesn't want to be saved?'. My answer to that would be yes to both. Would you like to be reincarnated as a dog? Yes. A sheet of paper with the words, 'The Sky Was The Colour Of The Death Of The Internet' painted in magenta watercolour in a font called Van Veen. In more than one place at the same time. Alchemical artists from the Middle Ages. One or more artificial intelligences. Does anyone remember how boring group exhibitions were before the growth of the curatorial industry? Shows had titles like, 'Ten German Artists', and all ten were men. To not wake up in the night. Suzanne Treister (b.1958 London UK) studied at St Martin's School of Art, London (1978-1981) and Chelsea College of Art and Design, London (1981- 1982) based in London having lived in Australia, New York and Berlin. Initially recognized in the 1980s as a painter, she became a pioneer in the digital/new media/web based field from the beginning of the 1990s, making work about emerging technologies, developing fictional worlds and international collaborative organizations. Utilizing various media, including video, the internet, interactive technologies, photography, drawing and watercolor, Treister has evolved a large body of work which engages with eccentric narratives and unconventional bodies of research to reveal structures that bind power, identity and knowledge. Often spanning several years, her projects comprise fantastic reinterpretations of given taxonomies and histories that examine the existence of covert, unseen forces at work in the world, whether corporate, military or paranormal. 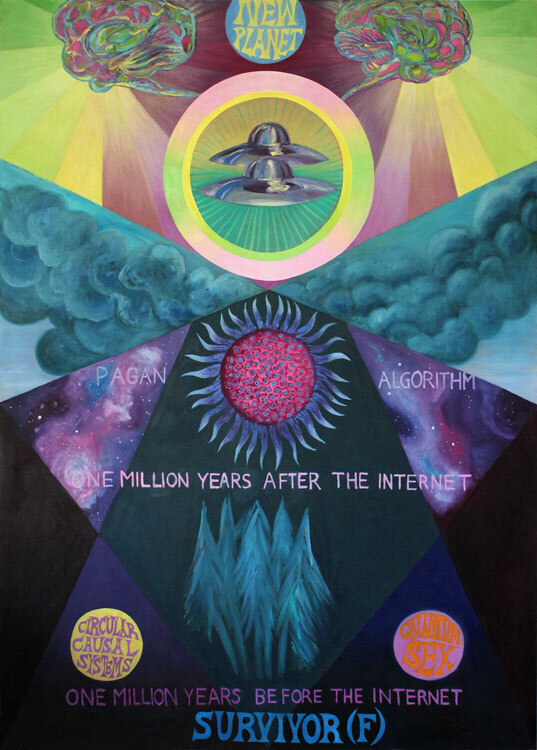 An ongoing focus of her work is the relationship between new technologies, society, alternative belief systems and the potential futures of humanity.